Oregon elected officials are critical of the attorney general's reversal of Obama-era policies on recreational marijuana. SALEM — Top Oregon politicians were quick to criticize news Thursday that U.S. Attorney General Jeff Sessions is rescinding an Obama-era stance on states that have legalized recreational marijuana. Although marijuana remains illegal under federal law, the policy, referred to as the Cole Memo, set out guidelines for federal prosecutors in states that had legalized marijuana to focus their resources on larger-scale concerns such as trafficking and continue to rely on state and local law enforcement to act in accordance with state laws and regulations. Recreational marijuana has been legal in Oregon for more than two years now, and in August, state economists predicted that Oregon could bring in about $142 million in marijuana tax revenue through mid-2019. Sessions on Thursday said he would let federal prosecutors in each state decide where they would focus their enforcement actions, but that states that have legalized marijuana were not exempt from federal drug laws. However, it's not clear that the announcement will lead to drastic changes in the way that federal officials in Oregon handle pot. Billy Williams, U.S. Attorney for the district of Oregon, said the memo directs U.S. attorneys to use "the reasoned exercise of discretion when pursuing prosecutions related to marijuana crimes." "We will continue working with our federal, state, local and tribal law enforcement partners to pursue shared public safety objectives, with an emphasis on stemming the overproduction of marijuana and the diversion of marijuana out of state, dismantling criminal organizations and thwarting violent crime in our communities," Williams said in a statement Thursday. Oregon Attorney General Ellen Rosenblum said the state Department of Justice would "continue to make sure Oregon's marijuana industry thrives under our carefully considered state regulatory requirements." Rosenblum, who characterized Sessions' decision as overreach, made no indication of specific next steps other than she "valued her working relationship" with Williams and looked forward to working with him. "This is an industry that Oregonians have chosen — and one I will do everything in my legal authority to protect," Rosenblum said. Oregon Gov. 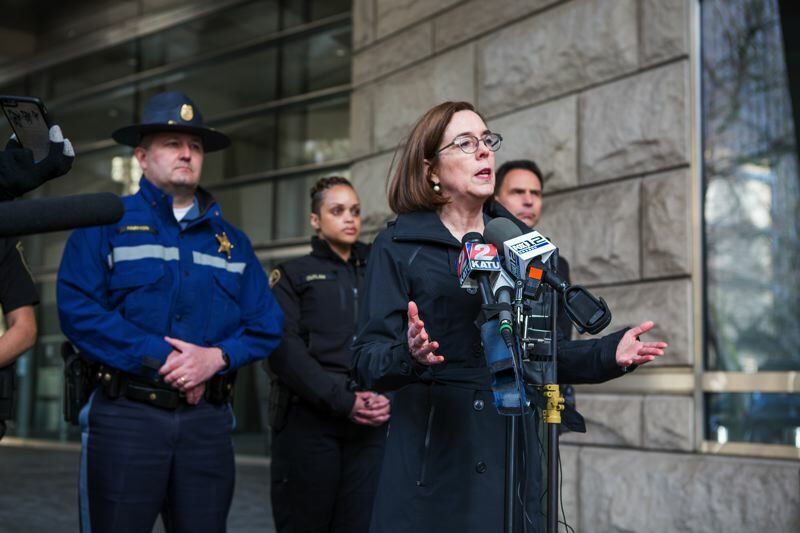 Kate Brown said in a statement that her office would "fight to continue Oregon's commitment to a safe and prosperous recreational marijuana market." "States are the laboratories of democracy, where progressive policies are developed and implemented for the benefit of their people," Brown said. "Voters in Oregon were clear when they chose for Oregon to legalize the sale of marijuana and the federal government should not stand in the way of the will of Oregonians." "Trump promised to let states set their own marijuana policies," U.S. Sen. Ron Wyden, D-Ore., said in a statement. "Now he's breaking that promise so that Jeff Sessions can pursue his extremist anti-marijuana crusade. Once again the Trump administration is doubling down on protecting states' rights only when they believe the state is right." U.S. Rep. Earl Blumenauer, D-Ore. — a member of the Congress Cannabis Caucus — called the move "outrageous" in a tweet. "Going against the majority of Americans — including a majority of Republican voters — who want the federal government to stay out of the way is perhaps one of the stupidest decisions that the attorney general has made," Blumenauer wrote. National anti-legalization advocates, meanwhile, praised the development. "This is a good day for public health," said Kevin Sabet, who leads the anti-legalization group Smart Approaches to Marijuana, said in a press release. "The days of safe harbor for multi-million dollar pot investments are over...investor, banker, funder beware." The decision is also setting another group of state bureaucrats scrambling: economists, who are charged with estimating tax revenues from the sale of recreational marijuana. State economist Josh Lehner indicated in a post on his blog Thursday morning that the impact of the action was not yet apparent. "Ultimately it will likely come down to enforcement, and the choices prosecutors make," Lehner wrote. State economists will be meeting with an advisory group to discuss the consequences of these changes and "other issues and trends in the recreational marijuana market," Lehner wrote. The next state revenue forecast is expected Feb. 16. Anthony Johnson, director of New Approach Oregon, a political action committee that advocated for the legalization of recreational marijuana, said he thought the impact on Oregon's marijuana industry would be limited. "Oregon already has a bustling cannabis industry that has really exceeded expectations when it comes to sales and revenues, so I don't see anyone pulling out or shutting their doors," Johnson said. "It can have a limited impact, and there may be some investors that thought about getting involved in the industry that are now shying away from it, particularly those that are extremely cautious." Johnson argues that the policy decision may turn out to hurt the politicians supporting it, given the growing support for legalization not just in Oregon, but across the country. Recreational marijuana became legal in California Jan. 1. "I think it's a Pyrrhic victory for them in that they've galvanized legalization supporters," Johnson said. He also believes that the Oregon U.S. Attorney will continue to take a "hands-off" approach. "...As far as the licensed, regulated businesses that are following state laws, I don't expect to see any prosecutions of good actors in the industry," Johnson said. In Oregon's capital city, Salem, marijuana proprietors had mixed assessments on the news. James Neal, a manager of The Joint on Market Street, a marijuana shop in Northeast Salem, was concerned. He said that there was "a lot of nervousness" in the industry about Sessions. "Everybody thinks he's kind of off his rocker," Neal said. But Kelly Bence, manager of Club Pitbull, a marijuana shop about a half-mile from the state capitol building, said that her business was taking "the wait-and-see approach." "We try not to overreact," Bence said.